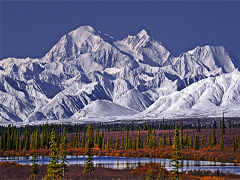 Travel Alaska Winter Vacation Packages from Anchorage and Fairbanks. Northern Alaska Aurora Borealis Tours, Dog Mushing at Denali National Park, Chena Hot Springs and Arctic Circle Northern Lights Observation, Alyeska Resort Ski Trips, Bald Eagle Viewing on the Kenai Peninsula, the start of the Iditarod Sled Dog Race and the Fur Rendezvous in Anchorage, Ice Carving World Championships and Snowmobiling. Visit Alaska for a Winter Adventure Tour of a Lifetime ! Travel Alaska during the winter months is a truly unforgettable experience. The last frontier is covered with a thick blanket of snow that invites you for snowmobiling, x-country skiing, dog sledding and northern lights (Aurora Borealis) observation. 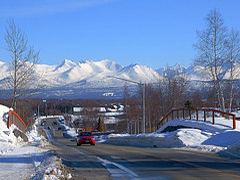 Travel along Turnagain Arm with the scenic snowcapped Kenai Mountains in the background, ski and rejuvenate at the world-class resort of Alyeska - Alaska's largest Ski Area - and enjoy a guided snowmobile or dog mushing tour from Talkeetna with towering 20.220 ft. Mt.McKinley in the background. The tour concludes at Chena Hot Springs with outstanding Northern Lights Viewing. 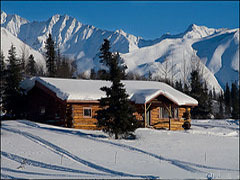 Travel along Turnagain Arm with the scenic snowcapped Kenai Mountain Range in the background, stay at the Alyeska Resort - Alaska’s largest Ski Area -, relax and rejuvenate in world-class spa facilities and enjoy the thrill of a guided wilderness snowmobile or dog mushing tour within the Chugach State Park. Your tour packages continues with a whale watching tour at the Kenai Fjords National Park, a visit of the Alaska Sealife Center in Seward for an inside view into a marine mammal rehabilitation facility and concludes with outstanding Bald Eagle viewing in Homer on the southern tip of Alaskas Kenai Peninsula. 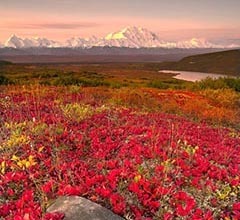 Alaska's Fall Foliage & Aurora Viewing Driving Tour! The short fall season is a perfect time to visit Alaska - the birch trees are turning into a stunning gold and the tundra is ablaze in a sea of red. Moose and caribou have shed their antler's velvet and skies are usually clear and deep blue. Your journey takes you on the Parks Highway via Talkeetna, Denali to Fairbanks and Chena Hot Springs. September is one of the best time to watch the Aurora Borealis (Northern Lights) The month combines both mild weather and dark skies. Experience the incredible beauty and grandeur of the winter in Alaska. For many people that live in Alaska, winter is their favourite time of the year. The scenery can be dazzling with the pure white snow, crisp blue skies and the northern lights are a formidable combination. You may also view the start of the biggest sporting event in Alaska - the Iditarod or the famous Fur Rendezvouz (Winter Carnival) if you arrive in late February or the first weekend in March. Be prepared for the adventure of a lifetime, and a winter holiday that will leave you with magical memories.